Zucchini Brownies are rich, chocolaty, and a favorite summer dessert! You will never know they are made with zucchini! Everyone is always looking for zucchini recipes during the summer months when zucchini is out of control, myself included. Our good friends gave us a zucchini the size of a baseball bat from their garden. I am trying to come up with creative ways to use our humongous zucchini. I love making my favorite zucchini breads, chocolate and lemon, but I wanted to try something new. Last night, we needed a dessert to take to a party, so I made chocolate chip zucchini brownies. Yes, dessert is always needed, especially when zucchini brownies are involved. They are SO good and one of my favorite summer desserts. I love baking with zucchini. You start with a green vegetable and end with a decadent dessert. I kind of feel like a magician because people are always so surprised when they find out zucchini is involved. Zucchini really is a magic ingredient. Zucchini makes these brownies extra special. When I pull a warm pan of brownies out of the oven everyone always gathers around for a taste because they don’t look like zucchini brownies, they look like a pan of fudgy, chocolaty brownies! Everyone lines up for a taste! They are always blown away because these brownies are perfection! They are so rich and delicious! You can use a large or small zucchini, the size doesn’t matter. I know a lot of people like to use overgrown zucchini for baking and that is just fine. Don’t let those big zucchini go to waste. Shred the zucchini with a cheese grater or food processor. I never peel the zucchini. I don’t squeeze out the moisture in the zucchini for this recipe. You want the brownies to be moist. If your zucchini is extra watery, you can squeeze it out a little in a paper towel, but don’t get rid of all of the moisture. Stir in 1 cup of the chocolate chips into the batter and save 1/4 cup for sprinkling on top. The chocolate chips make the brownies even more chocolaty, which is a very good thing! This recipe makes a 9×13-inch pan, which makes this brownie recipe a great one to share! Pro tip-cut the brownies with a plastic knife after they have cooled. A plastic knife is magic and doesn’t make a lot of crumbs. If you are still looking for ways to use up your garden zucchini, give these chocolate chip zucchini brownies a try! They are a favorite at our house! Make sure you check out our favorite zucchini recipes here! Rich and fudgy brownies made with zucchini, but you will never know it. They are SO good! Preheat oven to 350 degrees F. Grease an 9x13 baking pan with cooking spray, set aside. In a stand mixer, combine sugar, oil, and flour, combine until mixture resembles wet sand. It will be dry looking and that is ok. While mixing, on low, add cocoa, shredded zucchini, vanilla extract, salt and baking soda. Mix until well combined. The mixture will moisten once the zucchini is added. Stir in one cup of the chocolate chips. Pour brownie batter into prepared pan and sprinkle with remaining chocolate chips. Bake for 28-32 minutes or until a toothpick comes out clean and the brownies are set. Cool completely on a wire rack. Cut brownies into squares and serve. These look so chocolatey and fudgy! Delish! 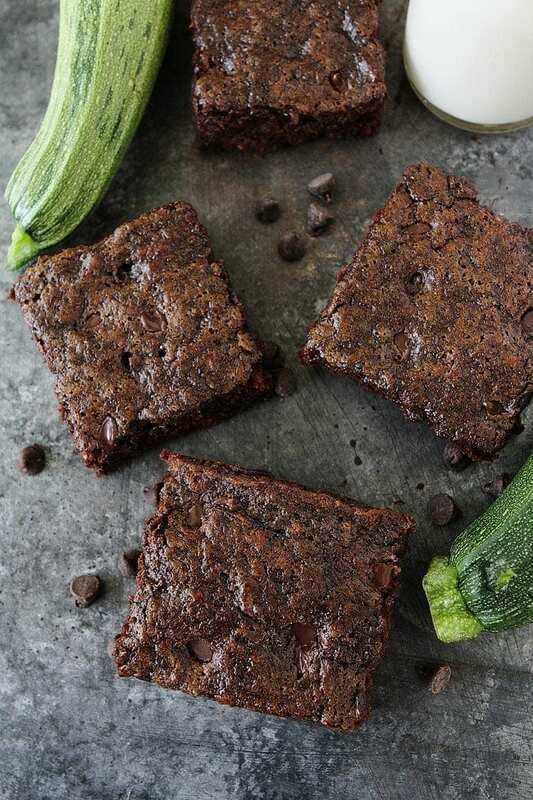 Wow, I never would have thought to put zucchini in brownies, but why not? It sounds like a fabulous idea! These sound delicious! I love chocolate zucchini bread so I’m sure the flavor is similar. Such a creative idea! Coincidentally, I posted about zucchini today too. I wonder if the kids would ever know? Worth a try, huh? I think these brownies would be a hit with the kids. They are so good! Wow, I think I’d eat one of these right now for breakfast! Yum! I love the sound of this! I might experiment to see if I can come up with a low-sugar version. I bet the zucchini made them moist and delish! Oh these would be perfect for my little ones. A perfect way to sneak in a few veggies. They look delicious Maria! What an interesting way to enjoy to enjoy this delicious veggie. What a fun idea, I would never have thought of this! 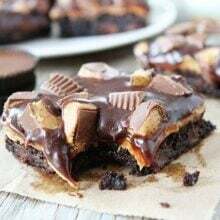 I may have to give these brownies a try, it might be the one way to get my fiance to eat his veggies! Another great way to use up zucchini!! Those brownies look fudgy and delicious! These look so amazing! They are so moist and delicious looking. When you tweeted this recipe last night it sounded so good! I’m glad you posted 🙂 love when you can find ways to add veggies into something delish. What a great idea! I love that you added zucchini to these tasty treats. What a great idea to add zuchinni to brownies. I’m going to have to give this a go. I don’t have zuke growing in my garden but I’m gonna go get some just for these brownies! I love throwing it in my chocolate baked goods- it just SO yummy! Any kind of brownie is a welcomed treat in my house! These look delicious. 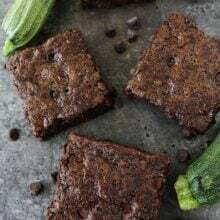 I love zucchini and I love brownies, so you’ve created their love child. I also think it’s great that you wrote “we needed a dessert to watch the opening NFL football game”. I was just having a discussion the other day with some friends that football season makse us think of great food. Brilliant! 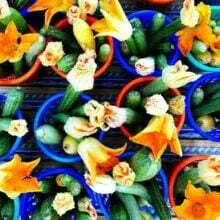 Yet another creative use for zucchini. My plant has started to produce a bumper crop and I needed some new ideas. I can see how the zucchini would add a lot of moisture and make brownies even chewier… great idea. Oh — and if you use yellow zucchini next time it might not get noticed! When it bakes, it sort of disappears because there’s less pigment in the skin. 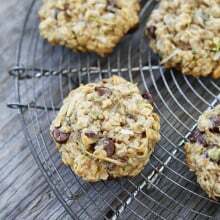 I have never baked with zucchini before, but this lovely recipe of yours just may have convinced me to try! Thank you for sharing these brownies, they look just great! Those do look great! I’ve heard it helps to disguise zucchini more if you peel the green skin off. But Glad your friends like them. I’m not picky about green in my brownies! Way to try to sneak a few veggies into your host family! these do look awfully chewy and fudgy. Yum! Oh, YEA!!!! And they are Vegan to boot! I will bake some today for my husband. Thank you. These look so good and not super fattening. I love your blog and it’s so simple and elegant. I will definitely be trying these, they look super fudgy! Made these tonight-they are soooo good. The edges get nice and chewy, the center is soft, and you’d never know from the taste that there’s zucchini in them-I feed them to DH and DD – both who hate zucchini (I know-blasphemy!) and they both loved them! Thanks! Glad you enjoyed the brownies! These do look good. I love zuchinni anything. i wonder how prominent the zucchini flavor is. this looks delicious and moist! I love using fruits and veggies in creative ways – zucchini in brownies is a new one but I’m excited to try it! I’m sure the zucchini made these brownies even more moist and delicious! What a yummy flavor combo and way to use up that zucchini! I’ve added this to my list to try! What a great way to add moistness to brownies without adding extra fat. when zukes that large emerge from the garden, i like to keep them by the door as potential weapons should someone try to break in. 🙂 great bars o’ chocolate, maria. Just made these and they are AWESOME! You can’t even tell there is zucchini in them! So simple – I also used dark chocolate cocoa powder and whole wheat pastry flour. This is such a creative flavor combo! I love it! Thanks for the link! 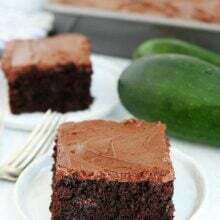 I haven’t tried making zucchini brownies yet but as you know…I have tons of zucchini so i will have to try your recipe!! I just made these a couple hours ago and they are so good. Mind you they aren’t fudgy or chewy like brownies but more like a really moist chocolate cake. I nearly added more oil because I thought it wouldn’t be enough but it is! I stumbled upon your blog, and totally love the use of zucchini in brownies. Wonder how this will taste. Will certainly be bookmarking this! Thanks for the awesome recipe! The brownies are very moist. You have to try them! I made these yesterday. I just found your blog last Friday. I do have to say they were delicious but I had to add some liquid to make these. Originally mine turned out like the wet sand with the shredded zuke mixed in. I added just enough skim milk to bring it together. Do you think it’s because of our altitude. I’m in WV. It might be because I have never had a problem. Usually the zucchini is plenty moist. This is a great way to get get my kids to great way to get my kids to eat some veggies….never seen a recipe for adding a veggie to brownies…definitely going to give these a try! Oh MY GOODNESS These are soooooo Good!!! I love your blog I love it I love it I love it. the apple rhubarb Bread is Fabulous also made both today!!! Thank you! Glad you are enjoying our recipes! These brownies have been a summer hit! I’ve made them for my family, my boyfriend’s family, all our friends (two batches for the pregnant girls) and will be making more today to take to a dinner. Thank you so much for the recipe! You are very welcome! Glad you are enjoying the zucchini brownies! What a great use of zucchini! These turned out delicious. The best part is that I got to sneak some veggies into my 3-year-old. Best of luck with your bundle of joy 🙂 Cherish and enjoy every minute because it certainly does go by fast. Thanks for another great recipe. Thanks Nicole! Glad you like the brownies! I am making these brownies. Once all the ingredients are added, they look like sand then. I think the recipe is missing the eggs? I plan to add 2. I have 2 cups of shredded zucchini in my freezer. Do you think I could thaw out the package and use that? I’ve never frozen zucchini before and I’ve heard it gets quite watery once thawed. Do you think I need to compensate for the water? I can’t wait to make these! Thank you so much! Yes, you can use frozen zucchini. Just thaw it out before using! Enjoy! Wishing you, Josh and Caleb the best! Question: if I am hand grating the zucchini, does it effect the brownies whether I squeeze the excess liquid out or not? I always pat the zucchini with a paper towel. I don’t squeeze out all of the liquid. Just found this recipe today and have this in my mixer. Like a few other posters, above, though, I’m wondering if something is missing from this? The mixture is essentially sand. There’s no way you can “pour” it into the baking pan. Seems like it needs something…milk/buttermilk, egg, margarine, etc. to make it adhere into something of baking consistency. Whit this recipe and the chocolate bread I finally can have my kind eating zucchini. So yummy! FYI, I ran out of oil so I did 1/4 cup oil and 1/4 cup applesauce. I also threw in the rest of a bag of heath bits (1/4-1/3 cup) to add to the deliciousness and they came out awesome. Thanks so much for the recipe! I’m so looking forward to trying these when my zucchini are ready. We love these brownies! They are so moist and yummy that I made a couple extra batches for the freezer!! I just made these and they are delicious! I tweaked it a bit, just out of curiosity, using 1/2 c. brown sugar and 3/4 c. white sugar. I made these for a BBQ yesterday. They were a big hit! YUM! These were delicious, but I needed to cook them a bit longer. Also, I think I should have grated the zucchini finer. I used a box grater and would recommend a food processor unless you like the texture of zucchini to be prominent- which tastes fine, but definitely leaves something crunchy in there. I’d make these again! Love the idea of adding white chocolate! Yum! Mmm! I’m serving these at a fundraiser for out local foodbank this week. We have a few vegans on staff so this should work deliciously. Good recipe! When it says to “pour” the batter into the pan, don’t worry that the batter is crumbly–these come out with the top looking like a crumb topping but they are soft in center and yummy! You cannot taste the zucchini at all. I will be making these again, and often! 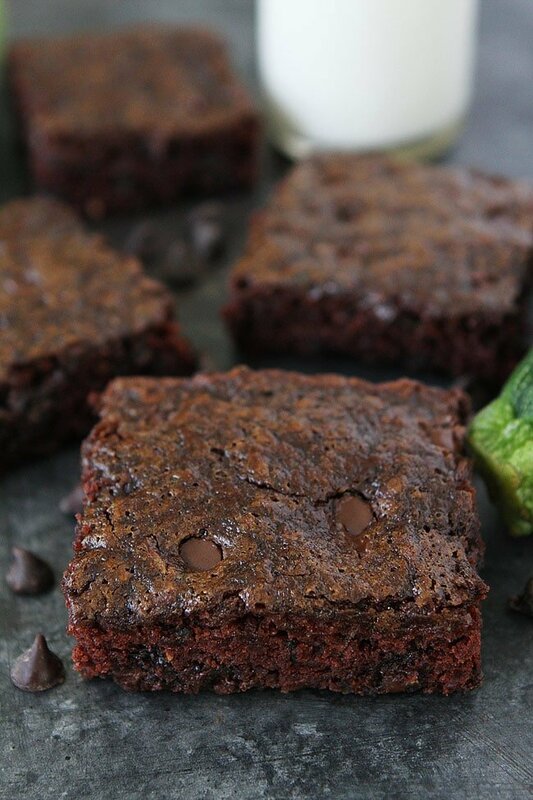 I’ve tried two different zucchini brownie recipes, and I must say these win! The other recipe was delicious but turned out like cake. You couldn’t call them brownies if you tried. These were a little more cake-like than I would’ve liked but definitely had a dense brownie quality to them. I think the chocolate chips made the difference because otherwise the ingredients and measurements were very similar. I would add more next time to give it a fudgier quality. I baked these in a 9×9 square metal pan. I had to cook it longer, but they turned out great. My hopes were that they wouldn’t lose as much moisture this way and stay fudgy. Thanks for the recipe! I was wondering, if I want to put dates/figs instead of granualted sugar, any idea aboutt eh quantity to substitute it? Cz this looks so good! I just made these, but the consistency is odd …. Is there supposed to be an egg in here? The gritty “wet sand” texture remained, even in the end. Otherwise, a delicious taste! I’ve never had a gritty texture, they are usually really moist. I never use eggs either. Maybe mix it for longer? Was your zucchini moist? Delicious~although I made some changes. The batter was so dry I added 1/2 cup chocolate almond milk and 1/3 cup vanilla honey yogurt. I also used 1/2 cup raw sugar for 1/2 cup of the granulated. Used dark chocolate chips. Yum! I’ve made these brownies twice this week and they are delicious! I don’t have an 8×11 pan, so the first time I used a 7×11 pan. That batch turned out as thick as a cake and took longer to bake. The second time I used a 9×13 pan and that turned out the perfect thickness for brownies. I swapped coconut oil for the canola oil, which worked fine. I read many reviews saying the batter was dry, so made sure to pack my two cups of shredded zucchini fairly tight to make sure I had a full two cups. My batter was perfect. This is a fantastic recipe! Made this last night -quadrupled the recipe due to a ridiculous overabundance of zucchini. Was a little concerned about how dry it was prior to adding the zucchini, but it moistened quickly after adding them. I did make it slightly differently that the recipe – I combined all of the dry ingredients, then added the oil to that and instead of vanilla extract I used almond extract. They are absolutely delicious and my husband said “outstanding!”. So, I now have a stockpile of outstanding zucchini brownies in the freezer! Sure does. I just made them. The zucchini has a ton of liquid in them, so it made it into a perfect batter. Probably a silly question but should I wring the water out of the zucchini first or no? Came across your recipe after seeing something similar on Pinterest. I just made these and followed the directions exactly, including the 8×11 pan size. The edges cooked nicely, but the majority of the pan did not cook, even though I left it in an extra 10 minutes. I’m not at a high altitude or anything like that.. Any ideas on this? I wonder if I used a 9×13 pan and they were thinner if they would cook better..? Also, I drizzled some melted chocolate and sprinkled the walnuts on the top. The batter I got was moist, not crumbly like in some other comments. It was more like a cookie dough. They taste great, even if I do have to eat them with a spoon! Thank you for the great recipe it turned out great! I’m a newbie to vegan cooking and thought this was a great recipe for a bbq last weekend. My friends and family loved it. Everyone wanted the recipe and was schocked to find out their was no egg or cow’s milk. I did add cloves, allspice and nutmeg but that’s how I make my homemade chococlate, chocolate chip zucchini cake. Thanks again I’ll be on the look out for more great recipes to try. Do you think they would freeze well? Glad they freeze great! Put them in the freezer before I saw your answer. I have got another batch in the oven today, but using a bigger pan and hand stirred. I used a 9×13 the first time around and they turned out as thick as cake…but still delicious. My brownies seem to always turn out like cake. Baked these up this afternoon. Used 1/4 C. applesauce and 1/4 C. oil and stirred it all by hand. Needed to bake for about 45 minutes. Delicious, moist, thick and fudgey! Hello! This recipe looks great! I have lot of avocados, may I substitute zucchini with them? in the same proportion? Thank you! THESE are literally my favorite brownie recipe ever. Ever since I got this recipe, they have been my go-to brownies. These are sooo moist and delicious and you don’t even notice the zucchini! They’re the BEST! What are the nutrition facts for this recipe. I am using myfitnesspal.com and need to know the Calories, Total Fat, Carbohydrates and Protein. Just from experience—this recipe could use the addition of 1/2 cup of almond milk! Other than that—it’s GREAT and literally my favorite brownie recipe ever!!!! I just made these yesterday. They were delicious. I used a 17 x 11 pan and they were thick and yummy. I added 2 eggs to the recipe as the dough was very dry and not pourable. The brownies were more cake like , but very good. I made these this evening and they are wonderful! The zucchini can’t be tasted, but it made them so fudgy and perfect. I used coconut oil in place of the canola oil. Glad you liked the brownies! Thus came out grainy and wouldn’t pour into the pan…it went in like sand…missing egg maybe? I’ve never used an egg in this recipe and they are just fine. The zucchini keeps them moist. Sorry you had issues! I made these tonight, and the flavor was delicious! I will put the dough into a 9×13 next time because the brownies came out too gooey in the center even though I had already baked them longer than stated. Absolutely Amazing! Delicious!! I just made them, soooo good! These turned out much more like cake for me than brownies. They were good — they just weren’t brownie-ish. Full disclosure, though, I only used 1c of sugar (1.5 just seemed like so much), I used plain greek yogurt for most of the oil, and I added an egg — I just couldn’t get the batter to come together without it (it was dry and crumbly). I’ve been following your blog and making a lot of your recipes – and loving them! – but I’m totally blown away by these brownies! I just made them and WHOA. They are seriously the best things EVER! I didn’t put any chocolate chips in because I didn’t have any and no worries – I didn’t miss them! WOW chocolate heaven! Thank you! Fabulous!! My, oh my!!! Thank you for sharing this recipe treasure!! I will say that this recipe works in a 9×9 pan if you add several minutes more to oven time. And I used dark Dutch processed cocoa which totally obliterated any visual hint of zucchini. The dark chocolate goodness was out of this world! Slather a chocolate buttercream on top and store in the fridge. It’s da bomb!! Recipe-find of summer 2014! These brownies are so good that I WILL NEVER make brownies from a box again. So easy, so delicious….and they freeze incredibly well. No eggs? Is that a mistake? I added two eggs. These are super delicious! I substituted agave for the sugar and they turned out very yummy. Will make again! I realize this is an older post, but I just made this recipe and am wondering about the lack of egg in the recipe. Is that correct? Mine never really set. The flavor is good, but the texture is a little odd. Made these today using the recipe almost to a t but used gluten free flour and a pan that was 12 1/2 by 7 1/2 (because that’s the closest I had). They turned out to be perfect fudgey brownies, like brownies should be. Thank you, for sure I’ll use this again and again. We made your recipe for zucchini brownies but there was definitely something wrong. We had to add eggs and milk otherwise it was a crumbly mess. Did you leave something out of your recipe? Just made these using a hand mixer. They looked pretty crumbly, so I hope they turn out! Knock on wood! I followed the recipe, but they isn’t enough moisture, it’s just a dry mixture wven with the zuchinni…….did I miss something? I made these brownies twice in the last week and I promise they work. The mixture does look dry when you are mixing it, but that is ok. The zucchini will moisten the brownies up. Did you bake them? Also, don’t squeeze out the moisture in the zucchini before adding it. I made these tonight for my family. The only switch I made was to use whole wheat white flour instead of white flour. They were amazing! I can’t believe there were no eggs in it. These brownies are super delish! I have never tasted such good brownies! So happy you liked the brownies! I made these last night, they are so delicious, chocolates and fudgey goodness. I used gluten free flour turned out great. Thanks for all the wonderful recipes!!! JUST made these. Definitely thicker than the picture and more cake like. 4 out of 4 kids ate one. Success!! This recipe is delicious. I substituted Trader Joe’s White Whole Wheat Flour for the white flour. The brownies are moist and fudgy. Everyone loves them – even the people who say they don’t like zucchini! Are these more “cakey” or do they have the texture of traditional brownies? Used mini chocolate chips…simply Delicious! Does anyone recommend halving the batter and using a 6×10 or 9×9 inch pan and adjusting the cooking time instead? I made this recipe today and must say they turned out very good. I have a son and daughter in law with food restrictions so finding recipes that they can eat can be tough. This is one that they can enjoy and will become a family favorite. Thank you. I made them without the chocolate chips and they were divine! I may add nuts next time because I like nuts in my brownies. Glad you enjoyed them! Nuts would be good too! I made these Chocolate Chip Zucchini Brownies today, they are yummy. Just made these last night and they are amazing! Brownies are my favorite dessert and these are perfect. These are the moistest brownies I have ever made! They were a huge hit. I peeled the zucchini so that the picky eaters would not recognize it. They ate them and asked for more! Yay! Glad they were a hit! do I need to refrigerate the brownies,? No, but if your house is really hot/humid, you can put them in the fridge. I had the same issue as some other readers – the batter was crumbly and would not have poured into the pan so I assed abou 1/3 cup of water which turned it into a wonderful batter (of course I taste-tested)! The issue must have been that my zucchini wasn’t moist enough, but adding the water did the trick. They are baking now, thanks for a great idea. *added* water, not assed. How embarrassing! Just made two batches of these gorgeous brownies – one as a Thank You and the other for weekend company. I couldn’t resist and took a small piece – amazing- so good. Thank you for a great, easy to make brownie recipe. I was worried at first that my zucchini was dry but I just mixed the batter a little longer and everything incorporated well and turned out perfectly. Amazing. My son said it was the best thing he’s ever eaten. A few bites in I told them they were zucchini brownies and they didn’t care. I just got this recipe from a friend last week, and I have got nothing but rave reviews on these. I am taking them to two family reunions this weekend, but I am sure they will be a hit there as well. I did however, decrease the sugar by 1/4 cup, and I also peeled the zucchini and removed the seeds, since some people don’t care to see the green flecks of the peel… Love these…. I love this recipe! I actually am on a restricted diet, so I can’t eat it. However, I love to bake and have made it twice for friends and family. I just entered a plate in the local fair and won first prize! I’m really digging these zucchini recipes. Thanks! Can you tell me how to adjust this for high altitude? I live in Denver. Delicious! Big hit with the kids! This is my favorite brownie recipe! My husband won’t eat anything containing zucchini. Well, up until now! LOL And when I want to make my adult version of this recipe I just add crushed, dried Thai peppers. OMG. Yum. These brownies are to die for they are so moist. I made them last week and we loved them. I took some to a friend and left the rest home and my husband couldn’t get over how moist they stayed for a couple days. Making them again today for a coming home party and can’t wait to hear the reactions of the people. I just made these brownies for my mother-in-law’s birthday. They were a hit with my in-laws and my two kids ages 4 and 16 months. The brownies came out moist and the perfect amount of chocolate. I will definitely be making these again! Thanks!